In One More Thing, a boy wins a $100,000 prize in a box of Frosted Flakes - only to discover that claiming the winnings may unravel his family. A woman sets out to seduce motivational speaker Tony Robbins - turning for help to the famed motivator himself. A school principal unveils a bold plan to permanently abolish arithmetic. An acclaimed ambulance driver seeks the courage to follow his heart and throw it all away to be a singer-songwriter. Author John Grisham contemplates a monumental typo. A new arrival in heaven, overwhelmed by infinite options, procrastinates over his long-ago promise to visit his grandmother. We meet a vengeance-minded hare, obsessed with scoring a rematch against the tortoise who ruined his life; and post-college friends who debate how to stage an intervention in the era of Facebook. We learn why wearing a red t-shirt every day is the key to finding love; how February got its name; and why the stock market is sometimes just... down. Finding inspiration in questions from the nature of perfection to the icing on carrot cake, from the deeply familiar to the intoxicatingly imaginative, One More Thing finds its heart in the most human of phenomena: love, fear, family, ambition, and the inner stirring for the one elusive element that might make a person complete. The stories in this collection are like nothing else, but they have one thing in common: they share the playful humor, deep heart, inquisitive mind, and altogether electrifying spirit of a writer with a fierce devotion to the entertainment of the reader. So it has taken me a long time to get into short stories, I've never been one for short stories because I always felt that there wasn't enough to keep me interested, or that by the time I got interested it ended. But so many people have talked about this book and even other short stories that I thought I needed to give it a try, and I can say I was hooked. Some of these stories were very intriguing and truly left me thinking about how well something can be achieved in such a short amount of words. The way B.J. 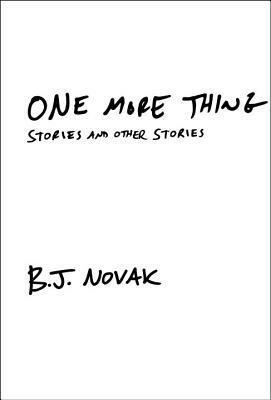 Novak introduces readers to so many characters and ideas in different stories truly awed me. It is even hard for me to sit here and name off which stories were my favourites because there were so many that kept me thinking long after I read them, though I can say that one that has still stuck with me long after I read it was "No One Goes to Heaven to See Dan Fogelberg". This story just shows how easy it can be to let things slide when you think you have all the time in the world. I do admit there were some stories that I read quickly and as soon as I went on to another one, I forgot about what I just read, though it did not happen often. B.J. Novak truly brings out stories that are moving and humorous and quite insightful at the same time. I truly see a different side of the actor B.J. Novak in his writing with these stories, and I hope to see more because this book truly helped bring me into reading more short stories. There are some great things that leave more to the mind and readers can draw their own conclusions as to what happens long after the story has ended. Each of the stories in this collection bring out essential components of life... family, friends, fear, love, companionship and everything that makes us who we are as a person. These are stories that everyone should take a chance to read, even those stories that may not necessarily mean a lot, they will still have an impact. I am glad I got the chance to finally read this after putting it off for so long. For readers that are not fans of short stories I believe that this book can change your mind.